Link: Denise Howell has the scoop on the 6th Circuit's reversal of the Lexmark DMCA injunction. "We should make clear that in the future companies . . . cannot use the DMCA in conjunction with copyright law to create monopolies of manufactured goods for themselves[.]" Read the opinion. Coverage by Jason Schultz of Copyfight. Via EFF: Lexmark's DMCA case against Static Control is aimed at eliminating aftermarket laser printer toner cartridges. Lexmark has implemented an "authentication" handshake between its printers and toner cartridges. 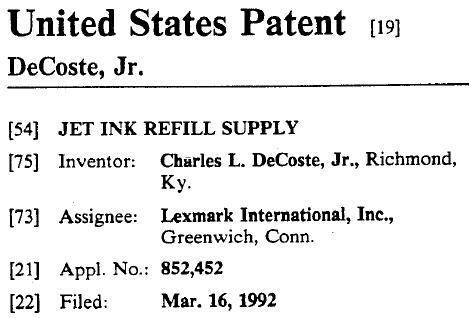 When Static Controls reverse-engineered the authentication procedure in order to enable refilled and remanufactured cartridges to work with Lexmark printers, Lexmark sued in Lexington, KY, claiming both copyright infringement and circumvention in violation of the DMCA. Read the Federal Circuit's rejection of the DMCA.